Children who lack confidence or who have poor communication skills need help to participate in group work and interacting with others. One teacher suggests having small ' I need Help ' cards on tables so that less confident children can turn these over instead of having to ask for help. Pupils who have difficulty communicating for a variety of reasons, can often feel excluded in situations where they are asked to 'discuss' in a small group or with a partner. 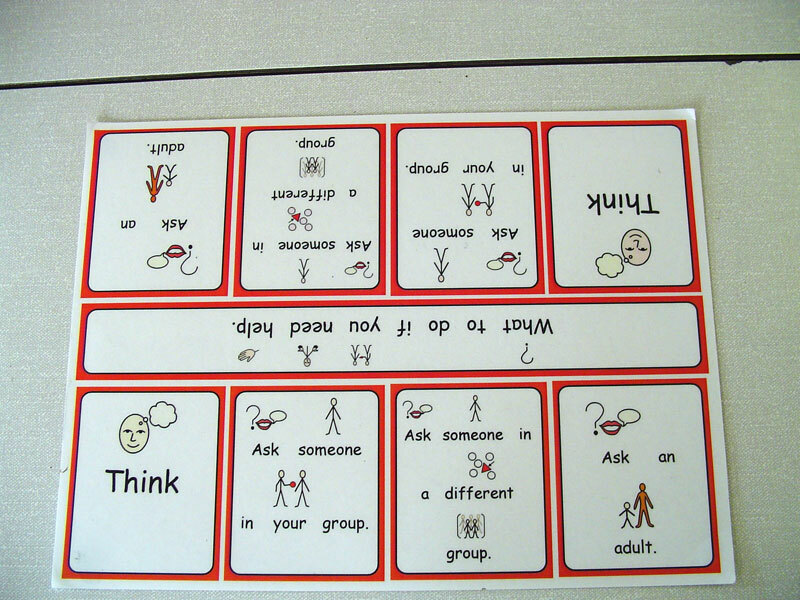 Using symbolised question cards or symbolised vocabulary sheets can allow inclusion and help to improve motivation and self-esteem. 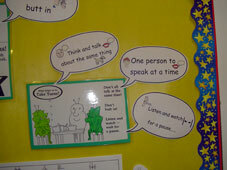 They help the pupil to remember the key vocabulary and formulate what they want to say. In this example a Year 1 boy used symbol question cards to talk to a peer in a Science Lesson. Y3 children enjoyed acting out an already familiar story. This familiarity increased confidence and they had a really good go at putting on different voices. 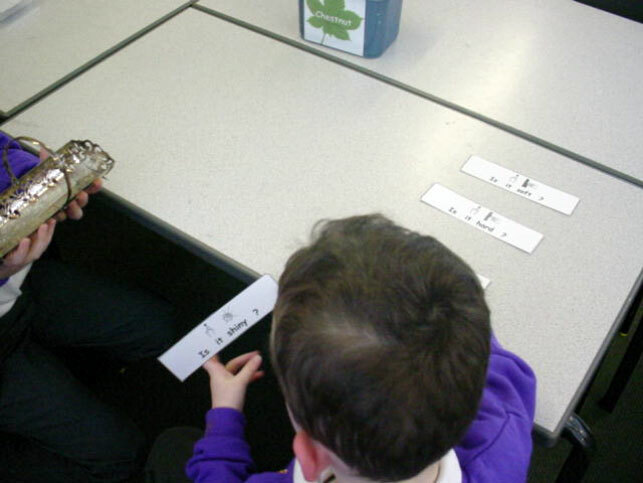 Normally shy pupils and those who often struggle with reading were encouraged to take part and enjoyed having the symbols there to support them. The rest of the class enjoyed watching the play being acted out. Good impact on self esteem for all group members. Beginning to see differences between layout of a story and a play. Here the Teacher is using a Story Board to tell a Reception Class a traditional story. The key characters are toys and key words have been made into symbol cards which are stuck to the Board in the order of the story. The visual materials prompt the children to join in and re tell the story. They love to take on the various roles in the story and 'do' the actions while holding the cards. 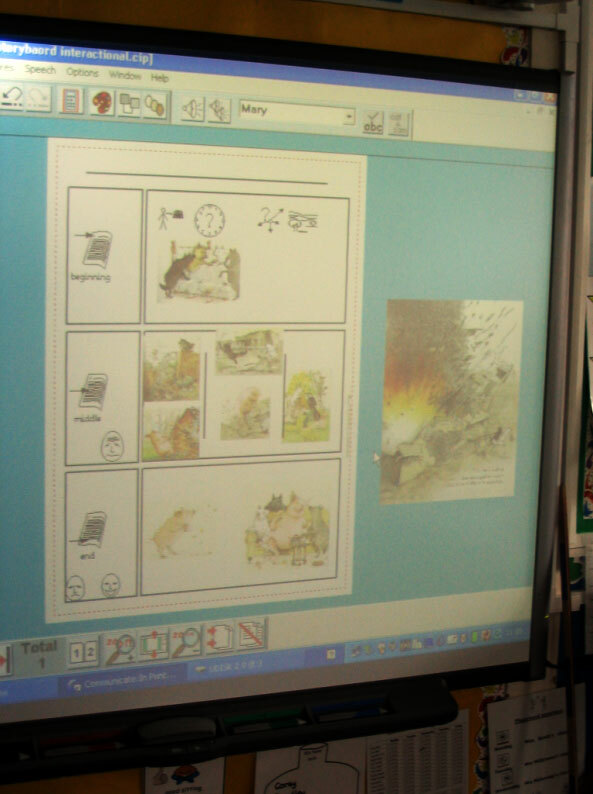 Example of a teacher using symbols and imported pictures to make an interactive story board for the class whiteboard. The story was the Three little Wolves and the Big Bad Pig. The was used by the whole class in the main teaching part of the lesson. Pupils who find learning challenging where text is involved are able to participate along with the rest of the class because of the visual support. Pupils in the ICT suite working together to make a story book. Using Communicate : In Print as the tool can make activities accessible to all pupils. 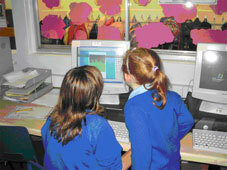 Social groups enable the teaching of important communication skills that some pupils don't automatically learn. 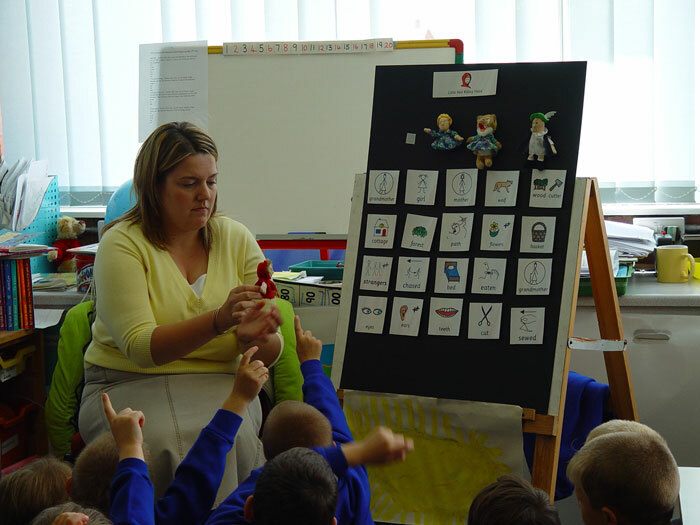 Pictures and symbolised resources are used to support and enhance the teaching points. The example above shows the 'working wall' for a Year 3 social group. 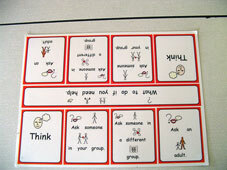 The 'rules' for speaking have been made as speech bubbles in Communicate : In Print with symbols to support the message. For example 'one person to speak at a time' has a symbol for a boy to denote the person and the symbol for speak. 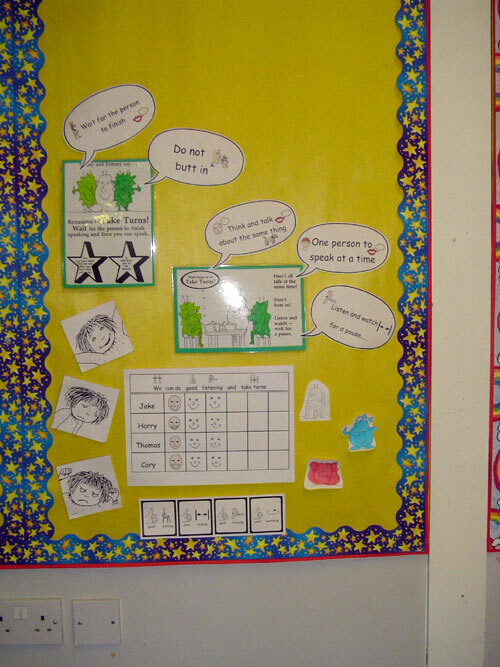 This makes the display more meaningful to the group members and it can be referred to easily during the session. 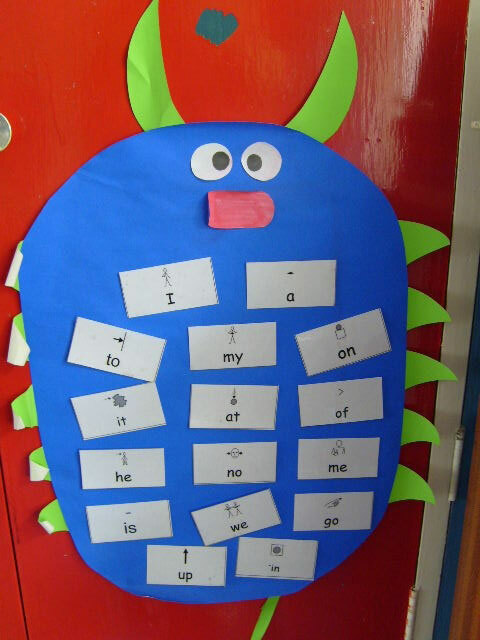 Symbol supported display of high frequency words. This was at eye level in a Reception class and the pupils could easily see it. The teacher changed the words after a two weeks for the next 15 words. 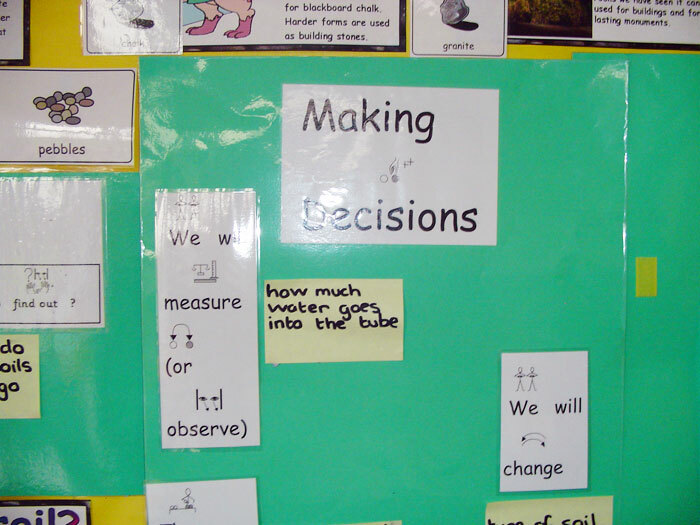 Science Investigation - visual working wall. 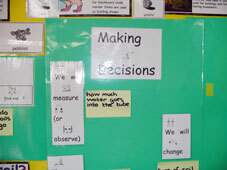 This display wall was used whenever the class were doing a science investigation. It reminded everyone of the key aspects of carrying out an investigation - apparatus, fair test, method and objective. All the pupils found it a good reminder of what they should be doing, and those who had difficulties with the scientific language had a visual prompt to refer to.